Watching the weather forecasts this week I did not expect to be leading the Elmley trip on a lovely sunny morning. On the track to the main reserve we saw marsh harrier, curlew, skylark, and lapwing. On the sacrificial crop near the farm goldfinch and linnet fed, and a robin ‘ticked’ as it joined them. Elmley is always a great venue, and we gathered at the car park full of enthusiasm on a sunny morning with a stiff westerly breeze but hardly a cloud. The bird feeders had their usual house sparrow and goldfinch with the farm chickens pecking below vying with moorhen for fallen seeds. 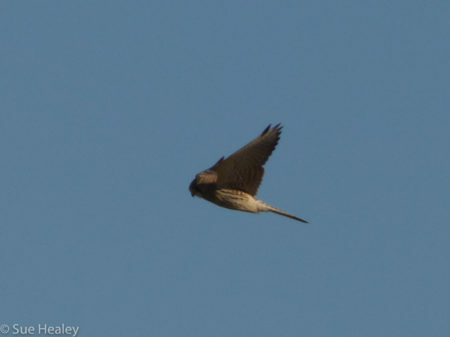 As we wandered along the track we had great views of stonechat, curlew and a very close kestrel which was perched on a nearby fence post and then gave a wonderful show as it hovered in front of us. Watch a slow motion video of it here. On the lakes there were mute swan, mallard, coot and teal. The tide was out but there were a few redshank, dunlin, black-tailed godwit and grey plover on the mud flats of the river. We continued our walk towards the hides finding reed bunting, little grebe, meadow pipit and pied wagtail on the way. From the hides we watched several common buzzard, and at least five marsh harrier. Flocks of brent goose, shelduck, shoveler and teal flew onto the reserve as the tide came in. Egyptian goose and white-fronted Goose were some way off but gave reasonable views. The white-fronts had very well marked barring on the belly and were great to see. Grey heron, snipe, cormorant, greylag and canada geese, black-headed and Lesser black-backed gull were all added to our ever-growing list. A merlin was seen perched first on a fence post and then on a piece of farm equipment, again great views were had by all. Well Marsh Hide provided the highlight of the day for me – a stunning ringtail hen harrier! It flew low and quick and was a real treat. We dashed from the hide to follow its progress along the seawall! A second pass a few moments later was more distant but the white rump still brightly visible. After our farewells we drove back down the long track with rain starting to fall – excellent timing. Elmley had a final treat for some of us though – as Malcolm spotted a barn owl hunting. An excellent end to a lovely day. Our wader sightings were sent through to Wader Conservation World Watch which took place this weekend, highlighting waders across the world. Thanks to everyone who attended and made this such a great day out. See you next time! p.s. News on the hedgehog. 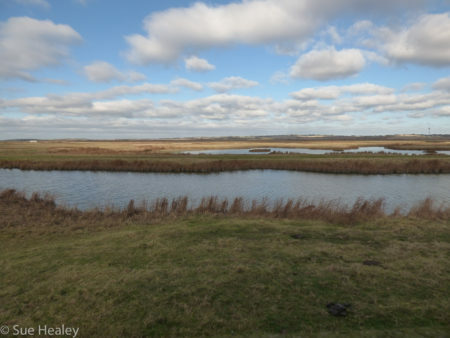 There is a thriving population of hedgehogs on the Elmley reserve and they are routinely trapped and moved when they are found in unsuitable areas. The one we saw was in a box set up for population research and sadly it was a juvenile that had tried to hibernate in it, but had already died.